Join your teammates for dinner tomorrow at our only fundraiser for the Spring season. Join your teammates for dinner on April 10th at our only fundraiser for the Spring season. Show your team spirit by joining us for a fundraiser to support Palo Cedro Youth Soccer Organization. Come in to the Chipotle at 961 Dana Dr Ste 160 in Redding on Tuesday, April 10th between 4:00pm and 8:00pm. Bring in this flyer, show it on your smartphone or tell the cashier you’re supporting the cause to make sure that 50% of the proceeds will be donated to Palo Cedro Youth Soccer Organization. 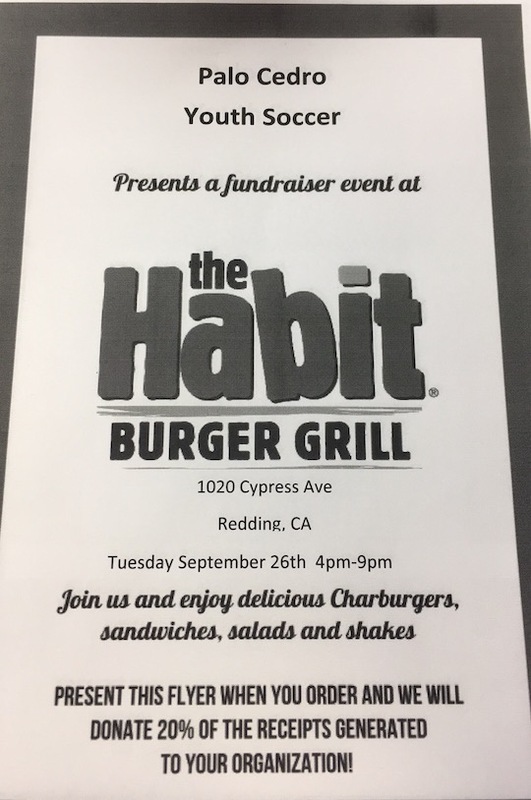 Support Palo Cedro Soccer by dining at the Habit Burger Grill in Redding on Wednesday, September 14th. Present this flyer or display it on your mobile device when you order.